Before starting a real estate transaction, either as a seller (grantor) or buyer (grantee), it's a good idea to review the laws that govern real estate deeds for the state. In California, the property statutes are found distributed throughout the Civil Code, so from this point forward, all citations refer back to the Civil Code unless otherwise marked. Standard real estate deeds are transfers "by which the title to property is conveyed from one living person to another" ( 1039). Title to real property can only be transferred by operation of law or by a written instrument -- a real estate deed -- and must be signed by the transferor (grantor) or an authorized representative ( 1091). Some details in a real estate deed are presumed unless specifically restricted or removed. So, there is no requirement for a deed to contain words of inheritance or to identify the transfer as passing a fee simple title (absolute ownership). ( 1072, 1105). These expectations are conveyed by using the word "grant" in "any conveyance by which an estate of inheritance or fee simple is to be passed, the following covenants, and none other, on the part of the grantor for himself and his heirs to the grantee, his heirs, and assigns." The deed contains covenants of warranty, assuring the grantee that "previous to the time of the execution of such conveyance, the grantor has not conveyed the same estate, or any right, title, or interest therein, to any person other than the grantee;" and that "such estate is at the time of the execution of such conveyance free from incumbrances done, made, or suffered by the grantor, or any person claiming under him" ( 1113). Section 1114 defines "incumbrances" as "taxes, assessments, and all liens upon real property." As a result of the implied covenants of warranty, the grantor is, in most circumstances, ultimately responsible for claims against the title ( 1107). In addition to conveying title to the purchaser, a real estate deed also passes all easements attached to the property unless otherwise noted in the document. ( 1104). 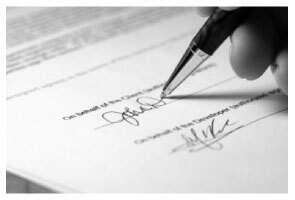 A comment about the grantor's name: If the grantor's name changed between the time he/she took ownership of the real estate and the time he/she sold it, the new deed must refer to both names. For example: "Jane Smith, formerly known as (or FKA) Jane Jones, grants to ...." The recorders index real estate deeds by grantors and grantees, so if the names do not match the records, the deed "shall not impart constructive notice of the contents thereof to subsequent purchasers and encumbrancers, but such conveyance is valid as between the parties thereto and those who have notice thereof." ( 1096). So, even though the deed validly transfers the property from grantor to grantee, the grantee may lose the title protection that arises from entering the transfer into the public record. Any person may buy or sell real property in California ( 671). When purchasing real estate with co-owners, it is essential to understand the different ways to hold title because each vesting choice carries different benefits and drawbacks. When identifying the grantee(s) by name on the deed, include the vesting decision as shown in the examples below. Property owned by more than one person is held in one of four ways: joint tenancy, partnership, community property with right of survivorship, or tenancy in common ( 682). Two or more people sharing equal ownership interests have the option to create a joint tenancy, which includes the right of survivorship. Survivorship provides an opportunity for co-owners to avoid probate because when one owner dies, his/her portion of the property rights automatically transfer to the other co-owners by function of law. It must be "expressly declared in the transfer to be a joint tenancy" in the granting clause of the deed ( 682.1(a), 683). For example: "AB conveys to BC and CD as joint tenants." Section 684 explains that a "partnership interest is one owned by several persons, in partnership, for partnership purposes." This type of ownership is discussed more thoroughly in numerous sections of the California Commercial Code. Community property with right of survivorship is only available to married couples, and like joint tenancy, must be expressly declared in the deed. For example: "AB conveys to BC and CD, a married couple, as community property with right of survivorship" ( 682.1). Also as with joint tenancy, if one spouse dies while they own property in this way, the surviving spouse gains sole ownership of the real estate without the need for probate. If not otherwise specified, every "interest created in favor of several persons in their own right is an interest in common" ( 686). With this type of co-ownership, each owner may claim a different percentage of the total property right. Each owner may also sell his/her portion without input from the others. This independent form of holding title does not include survivorship rights, so if co-owners die, their portion reverts back to their estate and the probate process determines its distribution. Once the statutory content and indexing requirements are met, the deed is ready to submit for recording. California Civil Code Section 1169 states that deeds "must be recorded by the County Recorder of the county in which the real property affected thereby is situated." A deed is viewed as recorded when the recorder's office accepts it, ( 1170) and the act of recordation provides constructive notice to future purchasers of a change in ownership ( 1213). Constructive notice is the expectation that parties involved in legal transactions have a duty to seek out information that is freely available in public records. California follows a race-notice recording act, which means that a later bona fide purchaser (buyer for value) who does not have notice of any other earlier conflicting interests, and records first, wins the property rights and will have priority over any later recordings ( 1214). Even so, an unrecorded deed is valid, but only between the grantor and grantee ( 1217).